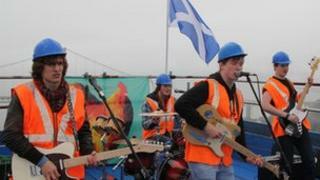 An Edinburgh band has made music history by becoming the first group to play on the Forth Rail Bridge. Bwani Junction played on the highest point of the 122-year-old structure. A replica of the rail bridge features in the band's video for their latest single, Two Bridges, which was filmed on the neighbouring Forth Road Bridge. In the video, the band repainted the rail bridge blue, just weeks after Network Rail completed the 10-year, £130m job to paint it red. The four-piece were raised more than 300 feet (91.5m) to a specially built platform by a lift, before performing three songs against the backdrop of the Firth and the Fife coastline. Bwani Junction, whose sound is characterised by African guitar music, had been talking to Network Rail for the past few months to organise the set. Craig Bowman, communications manager for Network Rail, said: "We've been able to grant one-off access following the completion of Forth Bridge restoration works earlier this year, so, following their last video, we'll be keeping a keen eye out to make sure that they don't start painting it blue." Before the performance, guitarist Dan Muir told BBC Radio Scotland a fear of heights meant he was "quietly nervous" at the prospect of scaling the bridge. But the band are in good company when it comes to scaling heights to perform - The Beatles famously played on their record company's roof in 1969 and U2 followed the trend with another celebrated rooftop performance in Los Angeles in 1987.